A serious vine and market garden pest, the Asian Tramp Snail has become well-established in eastern Australia from around Bega on the south coast of New South Wales northwards to the Wet Tropics region of north-eastern Queensland. This successful invader, originally from eastern Asia, has also penetrated inland as far as places such as Longreach, Queensland. 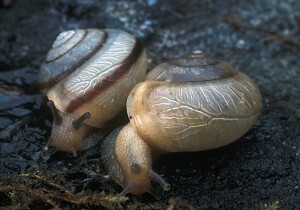 The shell is whitish to light brown with or without a brown band (see image) and can reach a diameter of around 15 mm. The animal is cream to light brown with cream to black optic tentacles. It lives under herbs and in foliage in nurseries, market gardens, vineyards, dunes and weed-infested bushland. Like the European Garden Snail (Cornu aspersum), this serious pest also thrives in modified environments such as well-watered gardens. In Australia: Bega, NSW northwards to Wet Tropics, NE Qld & inland regions.